The start of the Sussex Border Path sees you follow the River Rother inland for around 6 miles. The terrain varies slightly with most of it being longish grass covering slightly rutted mud. Fortunately the 2 times I've done this section the mud has been dry and there's been no dew in the grass. It's largely runnable for the first 3 miles before you'll start to hit some overgrown sections of nettles and longer grass that you need to tread through carefully. Had an issue with the 'no results' text not appearing in Views with no results using the latest dev release of Views. The patch - http://drupal.org/files/1677784-empty-area-fix.patch - which is for Drupal 7, but it fixes this issue, although the line numbers may not match. The Context module is great and does a lot of things. Web Omlette has a good summary of using the Context module for block administration. Context A places blocks 1 and 2 in the left sidebar. Context B places blocks 3 and 4 in the left sidebar. Although you can order the blocks in each individual context, you can't easily order them (you can apparently do so if you use the inline context UI rather than the admin one) when combining contexts. If page X matches both context A and context B it can be a bit of a mess in terms of the order of the blocks. You are most likely going to end up with A1, B3, A2, B4 but this isn't guaranteed. Guest post written by Grant Ellis. Each year, a gallant staff team from Action Medical Research bravely take on the PLOD - South Downs Way so who better to ask about the overnight walking event? Hopefully this will convince more people that they can do it too. Firstly, let’s start by saying that a PLOD is a brilliant experience but exhausting. You will feel absolutely shattered when you finish but the sense of achievement will be such that you will want to do another one despite saying at various times during the PLOD that this will be the last time. To get the most out of the CDN module in Drupal 6 you will need to apply a patch or use Pressflow. Pressflow is a customised Drupal core that provides various performance tweaks under the hood. A lot of these were included in Drupal 7. When you have a site which sells a single product the whole cart process seems all a bit too much especially as the cart adds nothing to the experience other than an additional screen and click which if anything will frustrate users. Aten Design Group have a great little guide on the required steps to do various tasks. Although the post was written in 2011 it still applies to the latest version of Drupal Commerce. In Views 3 a useful feature was added that when you had an empty view you could show a different view instead. 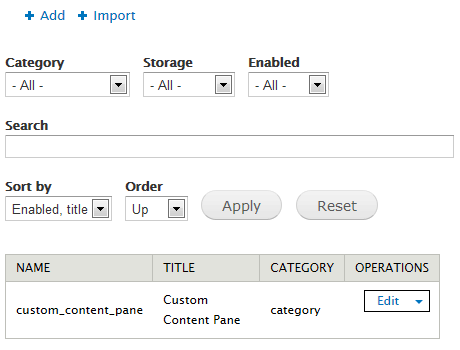 Unfortunately within Views UI in Drupal 6 you can only add a basic text area. You could set up a PHP filter but that could cause problems with security. This tutorial will guide you through showing another view if the original view is empty. Action Medical Research organise various cycle rides ranging from 100km/100-mile sportive rides across the UK to multi-day tours such as the Action London to Paris bike ride and the Action End2End. In 2012, over 6,500 riders took part in one of the RIDE 100 series sportive bike rides clocking up over 520,000 miles on the road.